In this book readers will travel to the outer extremities of experimental science to contemplate the unhallowed arts of re-animation, genetic engineering, galvanism, time travel, mind control, and psychedelic drugs. Center stage are the extreme scientists who challenged everything—nature, morality, the government, the law and sometimes even their own bodies—in pursuit of knowledge. Can you extract a man's soul from his body? Can you transplant a human head from one neck to another? What happens if you take LSD every day for 11 weeks? Can we travel through time? At some point, scientists have actively sought the answers to all these questions, but society often asks just one in reply: ‘Just because you can do something, does that mean you should?’ Extreme Science lifts the dustsheets off the past to explore the lives of people who pushed every possible boundary to get to the truth. Readers might find the content disturbing, however, all these bizarre experiments, and the scientists who performed them, have had a significant impact on the world in which we live. Not only that, but many have helped to shape the world we will be living in tomorrow.’ Chapters include: The Frankenstein Experiments; Electric Messiah; Two-Headed Frankenstein Hounds; Curing the Yellow Scourge; Dolphins and Drugs; Mind Control; The Lobotomists; Mind Games; Shock Tactics; Serial Killers and War Crimes; Robots, Cyborgs and Wormholes; Alias Captain Cyborg; Pagan Rocket Man; The Atom-Smashing Time Machine; Extreme Science in Popular Culture; more. A fascinating and visual deluxe hardback book! Published at $29.95, our price only $19.95! 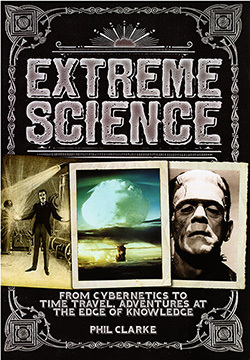 EXTREME SCIENCE: From Cybernetics to Time Travel, Adventures at the Edge of Knowledge By Phil Clarke. 192 Pages. 8x10 Hardback. Illustrated. All Color. References. Index.